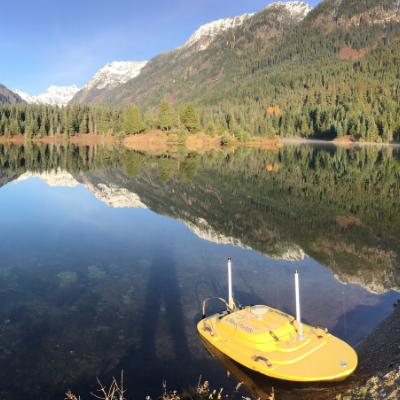 We spent some days in October in the field with Inter-Fluve to collect information on the upper Kachess River. 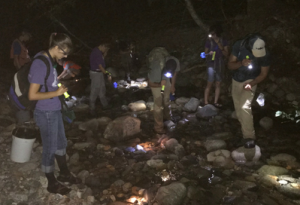 Our staff conducted survey work, gathered GPS points, took flow measurements, conducted gravel counts and collected stream bed samples. We also gathered LiDAR data that will be used in conjunction with the data collected on the ground. All of this information will help us better understand a heavily impacted river system and how to we can help enhance habitat for bull trout and other fish and wildlife. The dewatered reach on Kachess can extend over a mile of the river. 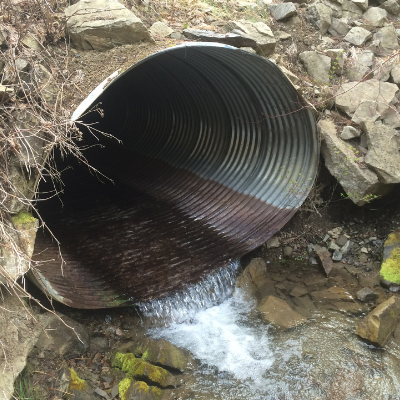 Human impacts have severely altered this important bull trout habitat. Mining on Mineral Creek began in the early 1900’s and continued until 1953 (Kugel, 45). Intensive clear cut logging also took place throughout the watershed including through the river corridor. Without vegetation in the floodplain, the riverbed became unstable. Kachess River is a “flashy” system meaning that it rises and falls quickly with precipitation. Flashy systems move lots of sediment and gravel and this becomes more pronounced when old growth trees are removed from the system. In this state, the stream bed moves often, removing riparian vegetation trying to take root in impacted areas. The cycle continues over and over and the river has a hard time re-establishing a healthy flood plain. 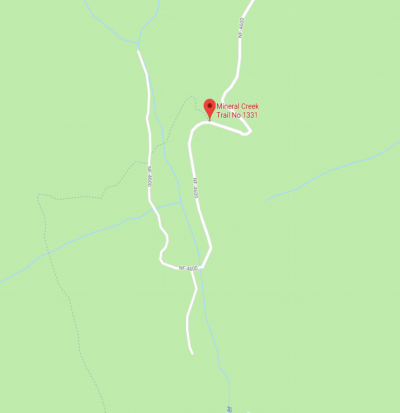 Although it isn’t depicted in this map, a road was annually plowed down the middle of Kachess River to access a landing on the southern harvest boundary. The road that leads down to what is now the Mineral Springs trail head puts lots of sediment into the system. When originally built, this road went from the parking area south to the riverbed, which altered tributaries that fed Kachess River. To make matters worse, during logging operations this road extended down the river bed to a landing on the opposite side of the river. Each winter and spring the road washed out when water levels rose and each summer another road was dozed back in. Putting in the road negatively impacted the river bed and removed trees from the system that are important for creating habitat and providing cover. Trees, or large woody debris, in river systems are critical to providing shelter, cover and habitat. Down trees catch other debris creating the log jams you see. Pools form under log jams where small fish hide and rest from fast moving water. Without shelter from fast moving water they are pushed out to the lake and eaten by lake dwelling predators. 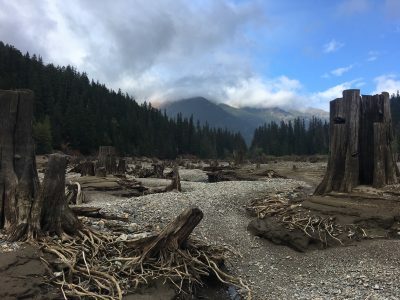 Before Kachess Dam was built, the newly anticipated lake beds were logged. A stump forest is what is left of the approximately 3/4 mile of habitat that was lost. 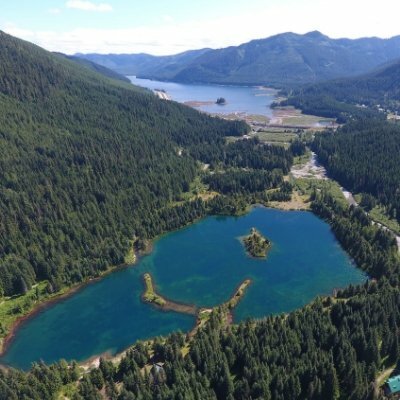 Finally, the construction of Kachess Dam in the early 1900’s has negatively impacted the system. A significant amount of habitat was lost when the lakes were raised – approximately 3/4 of a mile. The higher lake levels meant that sediment couldn’t be transported as it once had. When Little Kachess Lake is high in the spring it backs up water into the mouth of Kachess River. Gravels and sediments are then deposited much earlier in the system, raising the river bed height. As a result, when water levels fall in summer the water goes subsurface – also referred to as dewatering. Crews move young bull trout trapped in pools by dewatering upriver where water remains year round. 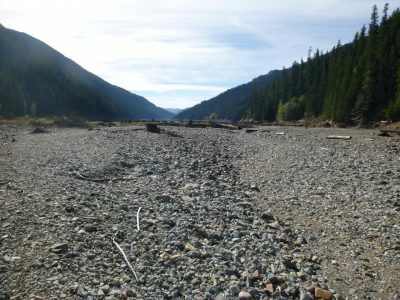 Scientists think that Kachess River always dewatered to some extent. The timing of Kachess bull trout traveling up to spawn is much later than their relatives in Box Canyon and Gold Creek. However, the extent of dewatering is likely much worse today than it was in the past due to the combination of human impacts and climate change. This means less habitat for young rearing bull trout, who spend 3 to 4 years growing larger before moving to lakes. 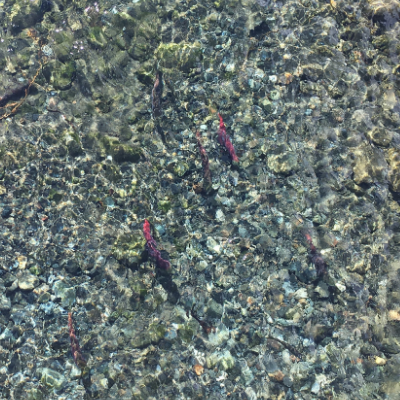 The process of dewatering takes place rapidly and young bull trout are not strong swimmers. As a result, they become trapped in pools and sections of stream that go dry and they die. Placing wood in strategic locations to create refuge during high flows so young fish aren’t pushed down river into the stretch that dewaters. Identifying the previous locations of tributaries before they were cut off by the road and reconnect them. We want to know the most effective ways of restoring the river, and that is where data comes in. Gathering data from gravel counts, ground surveys, LiDAR, flow and groundwater measurements, etc. will direct us where we need to go. For example, LiDAR data will provide us with insights into human impacts over the past 100 years, which we can then correct. The confluence of Mineral Creek (left) and Kachess River (right). Interesting fact: Mineral Creek contributes significantly more water than Kachess, but is much less utilized by bull trout when spawning. Kugel, Scott, “ABANDONED MINE LAND IMPACTS ON TRIBUTARIES IN THE UPPER YAKIMA RIVER WATERSHED, EASTERN CASCADES, WASHINGTON” (2018). All Master’s Theses. 939.